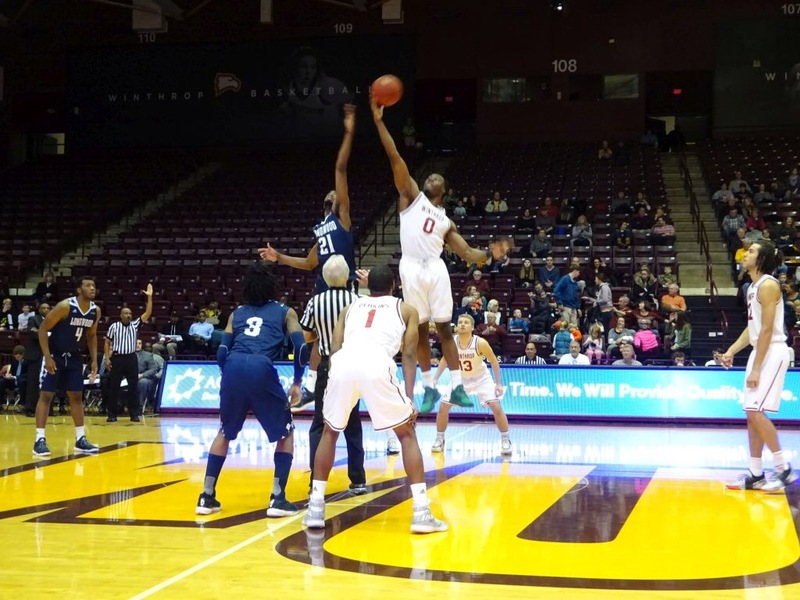 ROCK HILL, S.C. – The club all alone atop the Big South Conference and the league’s unanimous preseason champion took the floor in the Winthrop Coliseum on a wintry Saturday afternoon. To the surprise of many, those were not the same team. Longwood remained in first place after Saturday’s contest, but Winthrop got 20 points from Preseason Player of the Year Keon Johnson and double-figure scoring from three others to top the visiting Lancers, 83-65, in front of an announced crowd of 1,155. Gee’s club found itself trailing by 10 at the half, but posted a number of positives in the period. Winthrop (11-4, 3-1 Big South) shot just 35.9 percent in the period, converting on only 20 percent of its three-pointers. Johnson tallied only six points in the period, connecting on 3-of-8 tries. Longwood (6-9, 3-1) shot 42.3 percent in the period, but committed 10 turnovers that led to 16 Eagle points. The depth issue Gee discussed quickly came to the fore as the second half unfolded. The Lancers play just seven players in their regular rotation, and Winthrop hit the gas pedal to apply early pressure. That ten-point halftime advantage doubled in the first five minutes of the period, leaving the Lancers down 55-35 at the first media break. The Eagle lead swelled to as many as 28, and did not creep back into the teens until an Isaac Belton triple just ahead of the four-minute mark. Winthrop started the second half hitting its first four shots and eventually hitting 13 of 18 to open the stanza. The Eagles eventually slowed down a bit, connecting on just five of their last 20 tries to finish the half at 47.4 percent (18-for-38) and the game at 41.6 percent (32-for-77). Longwood actually outshot Winthrop for the second half (48.1 percent) and game (45.3 percent), but was done in by points off turnovers (31-8), points in the paint (40-28) and bench points (33-9), among other factors. Johnson paced Winthrop and all scorers with 20 points, adding six rebounds and four assists. Forward Xavier Cooks recorded his third double-double in four games, scoring 13 points and tallying 11 boards. Senior guard Rod Perkins equaled Cooks’ 13, with guard Anders Broman’s 10 completing Winthrop’s double-digit scorers. Perkins connected on 3-of-6 three-point attempts, including multiple tries when squaring up off ball screens. “In the first half, I kind of felt the game out, to see how the defense was playing. Once I see a shot, especially if I really feel good, I’m going to take it,” stated Perkins of his performance. The win pulls Winthrop into a five-way tie for first place in the Big South after two weeks. The Lancers and Eagles are tied with UNC Asheville, Liberty and Radford atop the circuit. Both schools return to conference play Wednesday evening. Longwood travels to UNC Asheville for a 7:00 (Eastern) start. Winthrop will host Presbyterian in a game slated for a 6:30 tip. LONGWOOD (6-9, 3-1 BIG SOUTH): Walton 3-6 0-0 7, Allen 4-14 1-2 12, Lane 6-12 2-3 14, Belton 4-7 2-3 11, Smith 4-6 3-4 12, Ezeani 0-0 0-0 0, Gee 0-3 2-2 2, Romeo 0-0 1-2 1, Shields 3-5 0-0 6. Totals 24-53 11-16 65. Halftime—Winthrop 34, Longwood 24. 3-Point Goals—Longwood 6-23 (Walton 1-3, Allen 3-9, Lane 0-3, Belton 1-4, Smith 1-3, Shields 0-1), Winthrop 10-36 (Perkins 3-6, Johnson 4-9, Cooks 0-3, B. Broman 0-4, A. Broman 2-6, Pickett 0-2, Ferguson 1-4, Poole 0-2). Fouled Out—None. Rebounds—Winthrop 42 (Cooks 11), Longwood 34 (Lane 6). Assists—Winthrop 13 (Johnson/Cooks 4), Longwood 4 (Gee 2). Total Fouls—Longwood 15, Winthrop 14. Technical—None. A—1155. Points in the Paint—Winthrop 40, Longwood 28. Points off Turnovers—Winthrop 31, Longwood 8. Second-Chance Points—Winthrop 14, Longwood 7. Fast Break Points—Winthrop 6, Longwood 2. Bench Points—Winthrop 33, Longwood 9.